Happy Halloween! Insert all the usual cliches now. By way of celebration, each of today's posts will have a scarefare theme. I imagine no-one else has thought of doing something similar. Hehe. 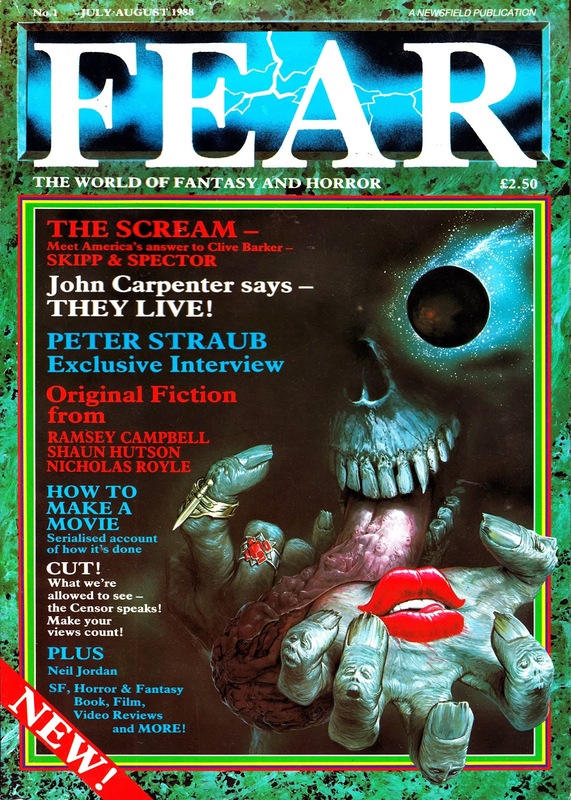 First out of the coffin is this, the launch issue of the British horror magazine FEAR, unseasonably published in July-August 1988. Edited by John Gilbert, and published by Newsfield Publications (previously responsible for LM, see here, and a whole bundle of computer magazines), this mixed movie and VHS articles and reviews with coverage of more literate endeavours in the genre, and original fiction. I remember this magazine from its original run (and I'm sure I bought a few at the time although I don't remember much about the specifics) and stumbled across a few back issues recently. The main attraction now (for me anyway) are the vintage film and video reviews along with the related advertising. It apparently continued until Newsfield went bust in 1991.